Categories: Advice, Business & Finance, Paginated Pages, Weekly. Nobody ever said investment had to be boring. In the Elizabethan days, Fools were the only people who could get away with telling the truth. 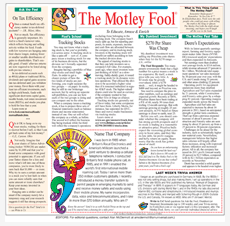 The Motley Fool tells the truth about investing and helps you laugh all the way to the bank. The Motley Fool brings lively investment advice to your readers. David Gardner, a native of Washington, D.C., graduated as a Morehead Scholar from the University of North Carolina at Chapel Hill in 1988. With many ideas and no regrets, he quit his job writing for Louis Rukeyser's Wall Street (the newsletter, not the TV show) in order to found The Motley Fool newsletter with his brother, Tom. Tom Gardner, a native of Washington, D.C., graduated with an honors degree in English and creative writing from Brown University, and has been formally trained in just about everything but finance. Once these brothers teamed up, there was no turning back. 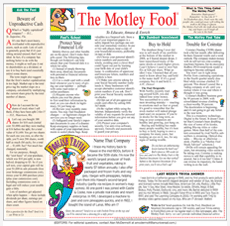 In 1994, Tom and David launched Fool.com, The Motley Fool's wildly popular website. The Motley Fool has since become an international multimedia company that reaches millions each month as it plays host to a celebrated community of individuals dedicated to helping each other make better financial decisions and improve their overall quality of life. Online, David directs and writes about the Rule Breaker Portfolio, a real-money stock portfolio designed to identify companies with high-growth potential, and which has been celebrated for its dramatic gains since inception. Tom established and writes about the Rule Maker Portfolio, a real-money stock portfolio designed to identify reputable, highly profitable large-cap companies that dominate their industries. Offline, David and Tom are the authors of several best-selling books, including "The Motley Fool Investment Guide," "You Have More Than You Think," "The Motley Fool Investment Workbook" and "Rule Breakers, Rule Makers." The Gardners also oversee The Motley Fool's nationally syndicated newspaper column, which is carried by nearly 300 newspapers. Nobody ever said investment had to be boring. In the Elizabethan days, Fools were the only people who could get away with telling the truth. The Motley Fool tells the truth about investing and helps you laugh all the way to the bank. In addition, The Motley Fool is a multimedia financial-services company that provides financial solutions for investors through various stock, investing, and personal finance products. The Alexandria, Virginia-based private company was founded in July 1993 by co-chairmen and brothers David and Tom Gardner. Carried by nearly 300 newspapers, "The Motley Fool" brings lively investment advice to your readers.